Seattle, WA – Bicycling nudists, Rwandan filmmakers and a Seattle family confronted by terrorism are the intriguing characters you’ll meet at the second annual SEED Arts Cinema Series SEEDArts Cinema Series, “Made in Seattle: Homegrown Documentaries”. The two-day series, April 4 & 5, is comprised of three dynamic, award-winning, locally made documentaries to be screened at the Rainier Valley Cultural Center, 3515 S Alaska St, Seattle, WA 98118. 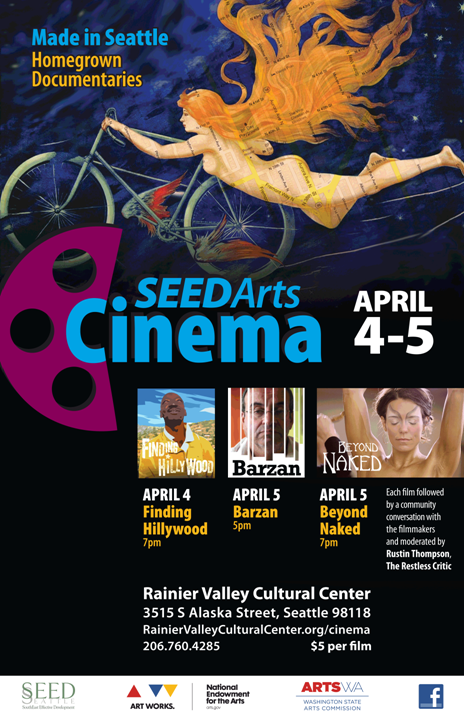 The films are Finding Hillywood (4/4 at 7pm), Barzan (4/5 at 5pm), and Beyond Naked (4/5 at 7pm). Each film will be followed by a community conversation with the filmmakers and moderated by Rustin Thompson, The Restless Critic. The Cinema Series opens on Friday, April 4 at 7pm with a screening of Finding Hillywood. Set amongst the hills of Rwanda, Finding Hillywood chronicles one man’s road to forgiveness, his effort to heal his country, and the realization that we all must one day face our past. A unique and endearing phenomenon film about the very beginning of Rwanda’s film industry and the pioneers who bring local films to rural communities. A real life example of the power of film to heal a man and a nation. The Series continues on Saturday, April 5, with an evening double feature. At 5 pm, we present Barzan by directors Alex Stonehill & Bradley Hutchinson. Barzan is an intimate portrait of a suburban family ripped apart by a terrorism accusation. Shot both in Iraq and Seattle, this investigative documentary examines terrorism, immigration, and the sacrifices we make to protect the American dream. The series concludes at 7pm with Beyond Naked, the “Best Documentary” of the Seattle True Independent Film Festival (2013). This film shows what happens when four first-timers accept a challenge to ride naked in Seattle’s legendary Solstice Parade. This feature-length documentary explores our deep-rooted fear and awkward fascination with nakedness through the lens of one of Seattle’s most popular traditions. Admission to the Cinema Series is $5 per film. All films will be screened on the new digital projection system at the Rainier Valley Cultural Center, 3515 S Alaska St, Seattle, WA 98118. Limited concessions will be available. For more information and updates, call 206.760.4285 or visit http://www.rainiervalleyculturalcenter.org/cinema. Seattle, WA — Rainier Valley Greenways announces the first Pop-up Greenway Event in South Seattle, Sunday, April 6, 2014, from 11am to 3pm in Columbia City at Ferdinand Street between 35th and 37th Street. A Pop-Up Greenway is a temporary installation to demonstrate and celebrate the effectiveness of neighborhood greenways. The Rainier Valley Pop-Up Greenway, located on a proposed greenway route near the Columbia City light rail station, will include faux painted speed humps, way-finding signs, sharrows and intersection improvement suggestions that demonstrate what a greenway could look like. The event will also feature food, walking tours, hands-on activities, and games for the whole family. Neighborhood greenways are residential streets close to commercial streets where people who walk and bike are given priority. They have slower speeds, less traffic and sometimes more trees, benches and other people-friendly features than main city streets. Greenways also connect community destinations like schools, parks, businesses and transit hubs. About Rainier Valley Greenways: Rainier Valley Greenways is part of a city-wide grassroots movement called Seattle Neighborhood Greenways that is helping residents and businesses transform Seattle into a city where we can all walk and bike more safely. Working with leading organizations, businesses, and social service groups in Southeast Seattle, the Rainier Valley Greenways group is participating in a variety of local events throughout the year, offering community presentations, and generating discussions online at: http://www.GoRVGreenways.com. By August 2014, they expect to have a Greenways plan that highlights the best opportunities for walking and bicycling routes from one end of Rainier Valley to the other. They’ll present the neighborhood-driven proposal to the City as a plan for prioritizing road and sidewalk repairs, traffic-calming elements, and other enhancements for safer walking and bicycling in Southeast Seattle. mation of the affordable apartment complex in Rainier Beach with a $50 million reinvestment package that rolls over part of the property’s current debt and frees $20 million for structural and tenant improvements. “This comprehensive renovation will greatly improve the home environments of the residents with upgrades to all 366 units-and will add 13 more,” stated Lance Matteson, Executive Director of SEED. SEED is a Southeast Seattle not-for-profit dedicated to economic, arts-based, and affordable housing development.